If the tenant wants to make a partial payment (either before or after you serve a 5-Day Notice to Pay or Quit) AND you wish to accept a partial rent payment (which the landlord IS NOT required to do), then you should use a "partial payment agreement." A "partial payment agreement," as defined by A.R.S. Section 33-1371, is a "contemporaneous writing" of the terms and conditions of the partial payment. A "contemporaneous writing" is a written agreement between the landlord and tenant that is signed by both parties at the time the partial payment is accepted by the landlord. The language in he agreement may be as simple as: "I, landlord, agree to accept from tenant a partial payment of $___. The remaining amount due of $___ shall be paid by tenant on or before _____. Failure of the landlord to have a tenant sign a "partial payment agreement" will prevent the landlord from evicting the tenant for nonpayment of the balance that the tenant agreed to pay. 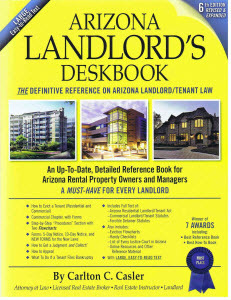 That does not mean that the landlord has waived for forfeited the balance due, it merely means that the landlord must wait until the next default (i.e., nonpayment of the next month's rent or some non-monetary default) before the landlord may evict the tenant.